Dave Dunwoody reports on the Ferry Pass fire station. The Escambia County Commission is set to vote Thursday, on adding 12 career firefighter positions to staff Escambia Fire-Rescue’s Ferry Pass station. The nine enlisted and three lieutenant slots will cost an additional $375,000 in salary and benefits. The idea came about after two residential fires on Good Friday. Neither of which were answered by Ferry Pass, the closest station, because of a shortage of volunteer firefighters. 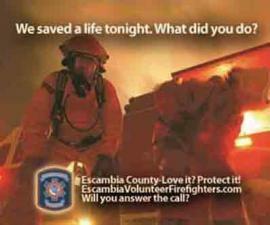 Data from Escambia Fire-Rescue shows that station was the agency’s busiest last year, fielding almost 21 hundred calls. But, about a third of them had to be answered by other stations. Commissioner Grover Robinson, whose District-4 includes the Ferry Pass area, attended a town hall meeting shortly after the fires. “What the citizens of Ferry Pass said loud and clear at the town hall meeting was, ‘Get somebody over there,’” Robinson said. After meeting with Escambia Fire-Rescue Chief Pat Grace, County Administrator Jack Brown last month told the County Commission that 12 paid firefighters – four each staffing three around-the-clock shifts – would be assigned to Ferry Pass. Brown also addressed what many consider to be a sometimes-contentious rivalry between volunteer and career firefighters. One obstacle is a change in training requirements by the state. The 40 hours of training once needed by volunteers, has risen to 206 hours. Escambia Fire-Rescue Chief Pat Grace says that’s exacerbating an existing problems in recruiting volunteers. A survey last year shows a 54% reduction in certified volunteer firefighters at the agency, and a 40% reduction in non-certified volunteers. As of last November, Escambia Fire-Rescue had lost more than 190 firefighters over the past five years. Along with Grace, many other firefighters in the area believe that the fewer volunteers available can lead to slower responses. At County Administrator Jack Brown’s direction, Chief Grace and Public Safety Director Mike Weaver will develop figures on staff, response, and missed calls. Brown also wants the Commission to accept training hours compiled online, which would be consistent with the state Fire College’s standards.